It is too much responsibility to be the “most beautiful bas-relief of the town”, in a town full of beautiful bas-reliefs. But the reader is going to give me some credit after visiting the headquarters of the Rio de Janeiro Commercial Association (ACRJ), also known as Palace of Commerce or House of the Businessman, at 9, Candelaria Street, in Downtown Rio. The original project, by French architect Henri Paul Pierre Sajous, had predicted an airier location for the building, which at the time could be seen from a very far distance. Recent constructions, however, have done the favor of hiding it from the carioca, and its appreciation has become very undermined these days. In several of his projects the architect Sajous formed a successful partnership with Belgian sculptor Albert Freyhoffer. On the crowning of the building there´s a huge bas-relief – something like 300 x 200 cm – representing the mythological god Mercury, Patron of Commerce, sided by two female allegories, in smaller scale, representing Architecture and Agriculture. This external bas-relief can be seen below, in two moments. 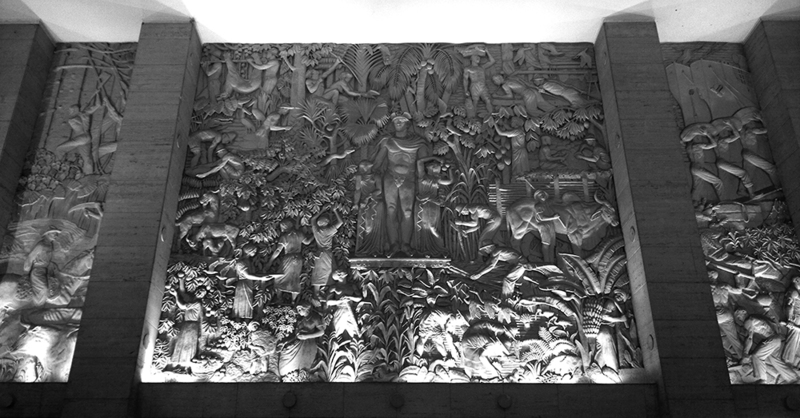 To observe the “most beautiful bas-relief of Rio de Janeiro”, it is necessary to address the building´s hall. Sculpted in Caen stone, it has 12 meters wide and 7 meters high and occupies the whole frontal face of this art déco building´s large hall. 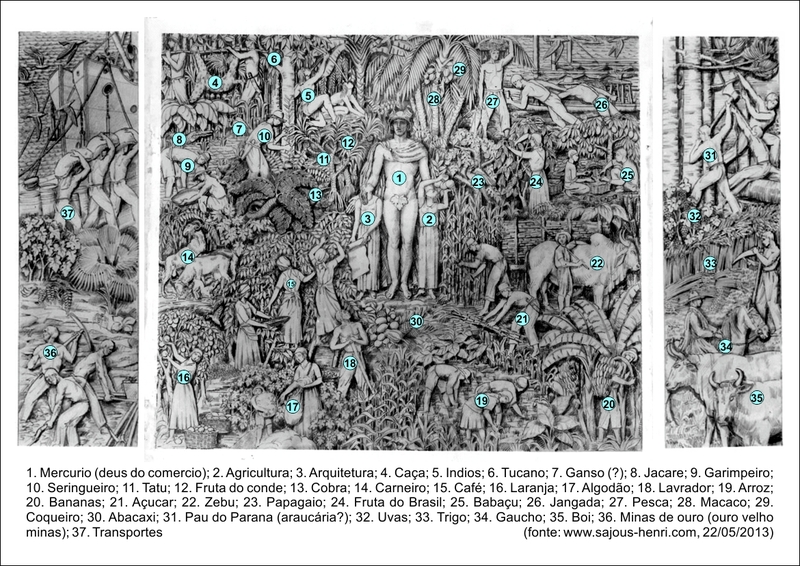 The tryptic panel depicts the various resources of Brazil. A study made by Freyhoffer himself, with these resources numbered and listed, can be seen below. Now is time for some mystery. Like the crowning´s bas-relief – the one to keep in mind, remember? 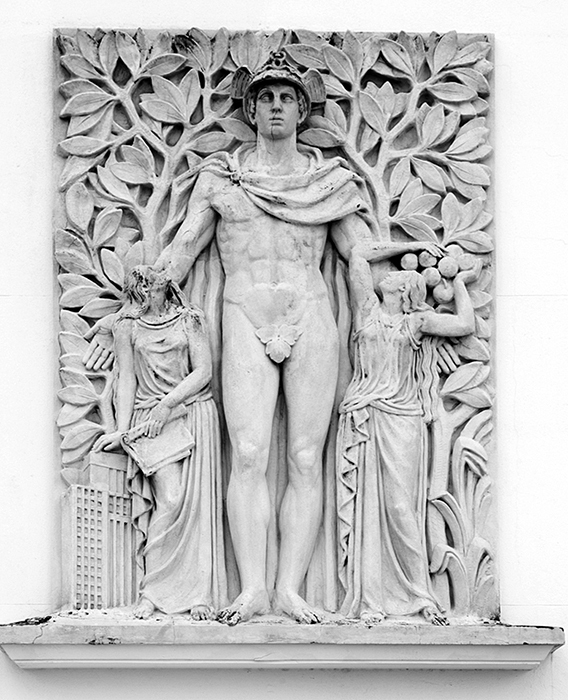 – the hall´s Mercury appears sided by the allegories of Architecture and Agriculture. In the drawing above, we can notice that the first one – the Architecture, right? -, on the left of the roman god, carries a plan view, but in the final bas-relief – seen below – the plan view has been unexplainably removed, and it feels that the allegory is “missing” its attribute, since it points with both hands below, where there is nothing, like it was complaining! The most curious thing is that, observing one more time the crowning´s bas-relief, we notice that the allegory of Architecture has received an attribute: the scale model of the building itself! Sajous projected several other important buildings in Rio, including the Biarritz Building, The Tabor and Loreto Building, The Santíssima Trindade Church and the Mesbla Building – this last one with the help of the Hungarian artist living in Brazil Geza Heller. While a new skyscraper is not erected at the Rosario Street Corner, a good point of observation is the Primeiro de Março Street, near the Justiça Eleitoral Cultural Center, former TRE-RJ. Historiography has not done justice to this artist, since very few are the works in which he is mentioned as an author. Beyond Palace of Commerce, here addressed, Freyhoffer has sculpted the Presidente Dutra Highway Monument´s bas-reliefs, today completely abandoned. 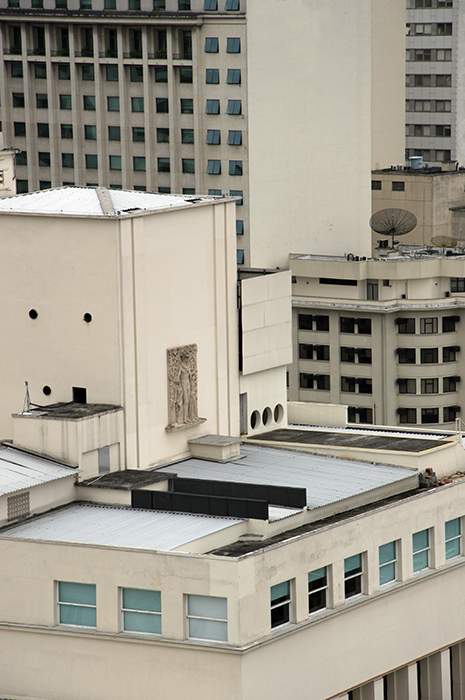 Also attributed to him are the beautiful bas-reliefs of São Joaquim Building, former headquarters of Rhodia (Companhia Brasileira Rhodiaceta), at Libero Badaró Street, in São Paulo. The picture has been produced by photographer Marcelo Naddeo, whom I thank. I also thank the excellent website about the architect Henri Sajous, kept by his grandnephew Marie Christine Sajous Clause – at http://www.sajous-henri.com/palacio%20do%20comercio%20br.html -, from where I have collected much of the information to this post. Unfortunately I have never received authorization to photograph this bas-relief “comme il faut”. I had to make do with this fortuitous image, made with a smartphone. Another spot to take a photo of the external bas-relief is at the 2nd or 3rd level of the Centro Cultural dos Correios. I went there and could see it. It’s an option for people having no access to the ACRJ’s building.